There is little wonder why this big guy is a popular request when the station books remote broadcasts for advertisers. But he's not a one-trick pony: he's also got mad "skillz" at onsite appearances, concerts and more. If a buzz is what you're looking for, mascots repeatedly generate photo ops that quickly translate into social media frenzies. What's more, despite their enormous size, cold-air inflatables are easy to transport and set up - the perfect set of features when mobile marketing is key to increasing your revenue. 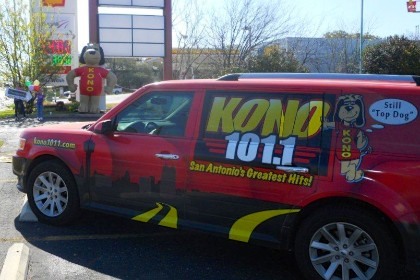 According to Sara Chadeck, Promotions Director of KONO, "[I chose Landmark Creations because they had a] reasonable price for a customized inflatable. The other inflatables featured [on their site] made me confident that they could produce exactly what I was looking for." If you attend live events where personal interaction is key, inflatables could be just the ticket. Looking for more creative radio station inflatables? Visit our online galleries!